Ever wonder why your wipers come on automatically when it rains? If your wipers come on automatically when it rains - you have a rain sensor. 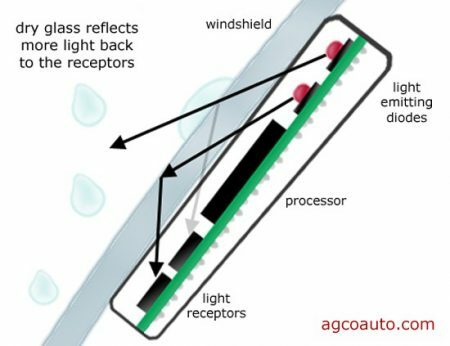 A rain sensor (often mounted behind the review mirror) detects moisture by reflecting an infrared beam of light off the outside surface of your windshield surface to an infrared sensor array. When rain, snow or sleet contacts the windshield, the rain sensor experiences an interruption to the infrared beam. Both, analog and digital signal processing determines the intensity of rain, sleet or snow. Your sensor then communicates with the windshield control module to switch on the wiper motor and adjusts the wipers automatically according to the level of rain, sleet or snow detected. When we replace your windshield, we take special steps to ensure your rain sensor is remounted and works correctly.